Neural organoids, also known as cerebral organoids, are hPSC-derived three-dimensional in vitro culture systems that recapitulate the developmental processes and organization of the developing human brain. These ‘mini-brains’ provide a physiologically relevant in vitro 3D brain model for the study of neurological development and disease processes that are unique to the human nervous system. They have important applications in studying human brain development and neurological disorders such as autism, schizophrenia or brain defects caused by Zika virus infection. We've created these resources to support your work with cerebral organoids, and to give you a glimpse into how cerebral organoids are being used by scientists in the field of neuroscience. In this webinar, Dr. Madeline Lancaster, who has done groundbreaking work in the development of cerebral organoid technology, discusses the latest developments in cerebral organoids and provides a comparison of different 3D model systems being used for neurological research. The human brain has fascinated scientists for centuries. Understanding its full capabilities and function is every neurobiologist’s dream; however, obtaining human brain tissue for experimental studies is difficult, for both practical and ethical reasons. Therefore, animals (mostly rodents) have traditionally been used as model organisms for neuroscience research, and for neurological disease and development research in particular. However, brain structure and development vary greatly between rodents and humans, and these animal models may not be fully representative of human disease pathology. Now, researchers can obtain human neural cells by differentiating human pluripotent stem cells (hPSCs), including induced pluripotent stem (iPS) and embryonic stem (ES) cells. The ability to generate human neural cells in a relatively simple and cost-effective manner has paved the way for neuroscience research that would not have been possible 10 years ago. Researchers now have access to a physiologically relevant human model for drug discovery, cell therapy validation and neurological disease research. And since patient-specific differentiated cell types can now be generated, iPS cells can be used to bridge the gap between studies using animal models and clinical research. Although we are now working with much more physiologically relevant neural models than before, there is still a long way to go until we can claim to have the ability to comprehensively model the human brain in vitro. An important development has been the establishment of three-dimensional (3D) cell culture models that better represent the structural complexity of the brain. Due to recent advances in 3D cell culture technologies, researchers can now complement their traditional two-dimensional (2D) cell culture paradigms with 3D models. 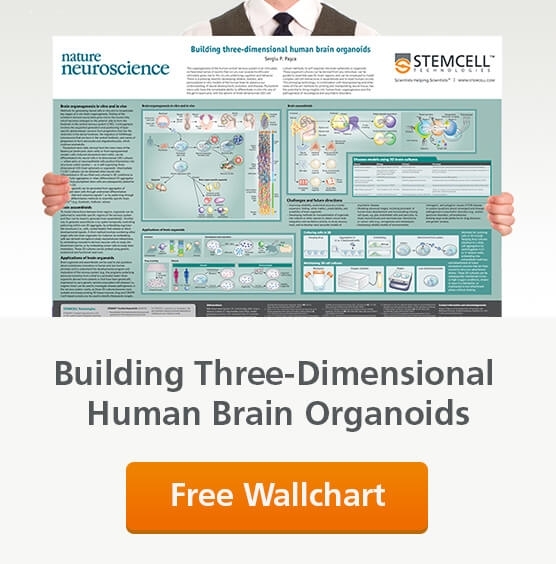 These include spheroids, regionally specified organoids and whole-brain organoids, and opens up new ways to study brain development and neurological diseases and disorders. Traditionally, adult and embryonic neurons have been cultured using 2D tissue culture techniques. This is a reductionist approach with which scientists have been able to identify key mechanistic pathways associated with relatively simple phenomena. A simplified culture system of enriched neurons has provided important and relevant insights into cell biology. However, because animal tissues, and the brain in particular, are extremely complex 3D arrangements of cells and extracellular matrices, 2D cell cultures are unable to fully represent complete tissues. Therefore, certain research questions, such as those relating to the structural development of neural tissues, cannot be addressed using a 2D cell culture system. In order to better model the human brain in vitro, researchers have realized that it is necessary to develop 3D brain models that recapitulate the brain’s structural arrangement. It’s important to note that compared to their established 2D counterparts, 3D cell culture systems are much more heterogeneous and complex, making them quite challenging to master and analyze. Indeed, 3D culture systems may never be amenable to certain assays, such as high-throughput mechanistic screening, for example. Researchers of the future will likely use a combination of 2D and 3D cell culture models to best answer their research questions. Simple 3D culture models used by neuroscientists include neurospheres and neural aggregates. Neural Aggregates: Neurosphere-like neural aggregates can also be formed using pluripotent stem cells, usually by first forming an embryoid body (EB).6 EBs are 3D aggregates of pluripotent stem cells that represent an early stage of embryonic development. Forming EBs from ES or iPS cell colonies is now a very common starting point in both directed and spontaneous differentiation protocols. In neural differentiation, CNS-type NPCs are generated from ES/iPS cells using EB-based neural induction; however, monolayer-based neural induction protocols are becoming increasingly popular.7 The NPCs produced are then usually transitioned to 2D culture for further differentiation into neurons and glial cells. Neurospheres and neural aggregates are useful 3D cell culture systems that can answer simple research questions; however, they are made up entirely of neural stem and progenitor cells and are devoid of other neural cell types such as neurons and astrocytes. To take the 3D culture system further, it is important to not only develop systems that contain all the relevant neural cell types in the brain, but also to have them structured in a manner that represents the brain’s in vivo cortical layering. Cortical spheroids and cerebral organoids are 3D brain models derived from hPSCs that have been shown to produce structures organized in a similar manner to the brain itself. The complexity in terms of cellular organization and composition is modulated by either omitting or adding exogenous patterning factors. Adding patterning factors results in models of a specific brain region (for example, midbrain or forebrain). Omitting patterning factors results in a heterogeneous structure with areas representing multiple brain regions within one model, a ‘mini brain’ or a whole-brain organoid. Cortical Spheroids: The introduction of 3D culture methods to generate spheroids took the iPS in vitro cell culture system one step closer to the in vivo environment. Eiraku et al. established a 3D culture system of ES cells and named it SFEBq: serum-free floating culture of embryoid body-like aggregates with quick reaggregation.15 This is an optimized version of the SFEB method that was developed by Watanabe et al.16 In SFEBq, the ES aggregates differentiate and form a neuroectoderm-like epithelium that generates cortical neurons that then self-organize in a manner reminiscent of early corticogenesis.15 This ‘cortical sphere’ culture system was later optimized further to demonstrate unique self-organizing aspects of human neocorticogenesis.17 Further advances were made in the lab of Sergiu Paşca.18 Paşca et al. developed neural structures, termed human cortical spheroids, from iPS cells in the absence of any extracellular matrix (ECM) and with minimal patterning factors. These spheroids contain both deep and superficial cortical neurons. Importantly, the neurons are interspersed with quiescent astrocytes, a difficult phenotype to obtain ex vivo, which play an important role in synapse formation and are essential for proper neural development.19-20 Transcriptional analyses revealed that after 2.5 months of culture, the spheres resemble the developing in vivo human prenatal brain. 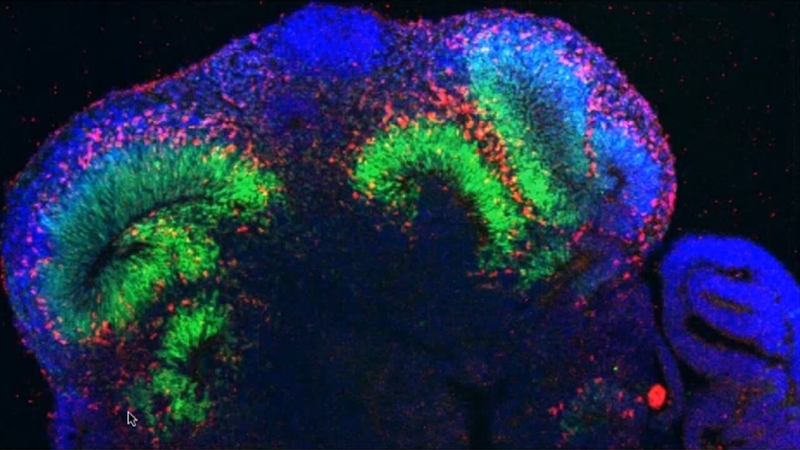 Cerebral Organoids or Whole-Brain Organoids: Up until the publication of Lancaster and Knoblich’s cerebral organoids, or ‘mini brains’ 21 model, no-one had generated single neural organoids that represented several different brain regions. Unlike cortical spheroids, cerebral organoids are cultured in conditions that promote self-organization and self-patterning. Instead, the aggregates are embedded in an ECM, Corning® Matrigel®. This ECM improves the polarization of the neural progenitor sheets and supports the outgrowth of large neuroepithelial buds. The buds then spontaneously develop into various brain regions in the absence of exogenous patterning factors. These regions contain ‘layers’ of neurons that resemble the organization of the developing human brain. The Lancaster protocol has been adapted further to generate midbrain-specific organoids.22 An additional development has been the application of 3D printing to generate a miniature spinning bioreactor.23 This allows independent control of the cerebral organoids in smaller volumes, compared to a typical bioreactor, which requires larger volumes and may suffer from more variability in organoid number and size. Since human brain tissue is difficult to obtain and established animal models can only model the human brain to a limited extent, hPSC-derived models are rapidly becoming an essential tool for human neurological disease modeling. iPS cells have already been used in many studies to model neurological disease and disorders.24-35 In these studies, 2D cell culture systems are used as the model. So far, a handful of studies have successfully used 3D cell culture techniques that more closely resemble the developing brain, demonstrating their promise as an advanced neurological disease model. In the first paper that described unpatterned development of whole-brain organoids, the researchers used the system to study microcephaly.21 The organoids developed from patient-derived iPS cells were smaller, reminiscent of the reduced brain size of patients with microcephaly. Because of the potential link between the Zika virus and infants with microcephaly,36 research into Zika has increased significantly using brain organoids as a useful tool to study the virus’ effect on brain development. In one study, Qian et al. modified the Lancaster protocol to generate dorsal forebrain-specific organoids and used them to model Zika virus exposure.23 After exposing the early stage forebrain-organoids to two different strains of the Zika virus, they observed an infection in the neural progenitors and an overall decrease in organoid size. Neuropsychiatric diseases, such as autism spectrum disorder (ASD), schizophrenia and bipolar disorder, have been notoriously hard to model since they affect cognitive and behavioral traits that are uniquely human.37 Using a 3D cell culture model, forebrain organoids were recently generated from patients with idiopathic ASD.30 When the organoids were compared with organoids generated from the patient’s unaffected relatives, the ASD-derived organoids showed an accelerated cell cycle, increase in synapse numbers and an overproduction of GABAergic neurons due to an overexpression of FOXG1. The authors speculated that the dysregulated gene expression of FOXG1 could be used as a potential biomarker for ASD in the future. The handful of studies that have been conducted using 3D organoids show their great potential in studying human-specific diseases and disorders where animal models are not sufficient.38 Looking ahead, however, there are many challenges facing researchers wishing to use brain organoids. While brain organoids are able to model the human brain remarkably well, it is still an in vitro model that lacks the typical patterning and environmental cues found in an intact embryo. The current methods for generating brain organoids do not result in an organoid that matures beyond the equivalent of the prenatal brain. Indeed, most studies using brain organoids have focused on studying early developmental events in the brain. For the many disorders and diseases that develop later in fetal development, the current models are not sufficient. One of the biggest obstacles in growing these later-stage organoids is lack of vascularization. In the developing brain, blood vessels have obvious roles in gas exchange, nutrient supply and waste removal.39 Introducing vasculature to the organoid, for example using mesenchymal cells or iPS-derived endothelial cells, could prevent cell death and enable the growth of a larger-sized organoid that may develop past the prenatal stage.37 Another cell type that is often overlooked is microglia. The resident macrophages of the brain, microglia are non-ectoderm-derived and therefore do not appear in any of the classic 2D cell culture systems or the newly advanced 3D cell culture systems that go through a neuroectoderm intermediate. But since microglia have been shown to be important for development and pathogenesis of the nervous system,40 introducing them to an organoid culture system will likely be beneficial if they are able to migrate in and take up residence as functional, ramified microglia. These and other protocol modifications will likely increase the diversity of cell types produced as the organoid matures - perhaps even facilitate connectivity between different regions of the brain. Perhaps the biggest caveat to the organoid technology is its limited reproducibility,21 although the same can be said about most 3D cell culture models.37 If organoids are to be used in toxicity screening or other high-throughput testing, this reproducibility problem must be addressed. Models such as the cortical spheroid that use patterning factors to control the end-result of the organoids could partly provide the answer. Future models could involve the controlled assembly of regionally specified organoids or spheroids into complex tissues that more comprehensively and reproducibly resemble the developing human brain in vitro. Reynolds BA & Weiss S. (1992) Generation of neurons and astrocytes from isolated cells of the adult mammalian central nervous system. Science 255(5052): 1707–10. Tropepe V et al. (1999) Distinct neural stem cells proliferate in response to EGF and FGF in the developing mouse telencephalon. Dev Biol 208(1): 166–88. Tropepe V et al. (2001) Direct neural fate specification from embryonic stem cells: A primitive mammalian neural stem cell stage acquired through a default mechanism. Neuron 30(1): 65–78. Conti L et al. (2005) Niche-independent symmetrical self-renewal of a mammalian tissue stem cell. PLoS Biol 3(9): 1594–1606. Pollard SM et al. (2008) Fibroblast growth factor induces a neural stem cell phenotype in foetal forebrain progenitors and during embryonic stem cell differentiation. Mol Cell Neurosci 38(3): 393–403. Zhang SC et al. (2001) In vitro differentiation of transplantable neural precursors from human embryonic stem cells. Nat Biotechnol 19(12): 1129–33. Chambers SM et al. (2009) Highly efficient neural conversion of human ES and iPS cells by dual inhibition of SMAD signaling. Nature Biotechnology 27(3): 275-80. Elkabetz Y et al. (2008) Human ES cell-derived neural rosettes reveal a functionally distinct early neural stem cell stage. Genes Dev 22(2): 152-65. Li X-J et al. (2009) Coordination of sonic hedgehog and Wnt signaling determines ventral and dorsal telencephalic neuron types from human embryonic stem cells. Development 136(23): 4055–63. Ye W et al. (1998) FGF and Shh signals control dopaminergic and serotonergic cell fate in the anterior neural plate. Cell 93(5): 755–66. Kim J-E et al. (2011) Investigating synapse formation and function using human pluripotent stem cell-derived neurons. Proc Natl Acad Sci U S A 108(7): 3005–10. Li X-J et al. (2005) Specification of motoneurons from human embryonic stem cells. Nat Biotechnol 23(2): 215–21. Fasano CA et al. (2010) Efficient derivation of functional floor plate tissue from human embryonic stem cells. Cell Stem Cell 6(4): 336–47. Seaberg RM & van der Kooy D. (2002) Adult rodent neurogenic regions: the ventricular subependyma contains neural stem cells, but the dentate gyrus contains restricted progenitors. J Neurosci 22(5): 1784– 93. Eiraku M et al. (2008) Self-organized formation of polarized cortical tissues from ESCs and its active manipulation by extrinsic signals. Cell Stem Cell 3(5): 519–32. Watanabe K et al. (2005) Directed differentiation of telencephalic precursors from embryonic stem cells. Nat Neurosci 8(3): 288–96. Kadoshima T et al. (2013) Self-organization of axial polarity, inside-out layer pattern, and species-specific progenitor dynamics in human ES cell-derived neocortex. Proc Natl Acad Sci U S A 110(50): 20284–9. Paşca AM et al. (2015) Functional cortical neurons and astrocytes from human pluripotent stem cells in 3D culture. Nat Methods 12(7): 671–8. Pfrieger FW & Barres BA. (1997) Synaptic efficacy enhanced by glial cells in vitro. Science 277(5332): 1684–7. Ullian EM et al. (2001) Control of synapse number by glia. Science 291(5504): 657–61. Lancaster MA et al. (2013) Cerebral organoids model human brain development and microcephaly. Nature 501(1): 373–9. Jo J et al. (2016) Midbrain-like organoids from human pluripotent stem cells contain functional dopaminergic and neuromelanin-producing neurons. Cell Stem Cell. 19(2): 248-257. Qian X et al. (2016) Brain-region-specific organoids using mini-bioreactors for modeling ZIKV exposure. Cell 165(5): 1238–54. Brennand KJ et al. (2011) Modelling schizophrenia using human induced pluripotent stem cells. Nature 473(7346): 221–5. Marchetto MCNM et al. (2010) A model for neural development and treatment of Rett syndrome using human induced pluripotent stem cells. Cell 143(4): 527–39. Mertens J et al. (2015) Differential responses to lithium in hyperexcitable neurons from patients with bipolar disorder. Nature 527(7576): 95–9. Wen Z et al. (2014) Synaptic dysregulation in a human iPS cell model of mental disorders. Nature 515(7527): 414–8. Yoon KJ et al. (2014) Modeling a genetic risk for schizophrenia in iPSCs and Mice reveals neural stem cell deficits associated with adherens junctions and polarity. Cell Stem Cell 15(1): 79–91. Shcheglovitov A et al. (2013) SHANK3 and IGF1 restore synaptic deficits in neurons from 22q13 deletion syndrome patients. Nature 503(7475): 267–71. Mariani J et al. (2015) FOXG1-dependent dysregulation of GABA/glutamate neuron differentiation in autism spectrum disorders. Cell 162(2): 375–90. Griesi-Oliveira K et al. (2015) Modeling non-syndromic autism and the impact of TRPC6 disruption in human neurons. Mol Psychiatry 20(11): 1350–65. Muotri AR et al. (2010) L1 retrotransposition in neurons is modulated by MeCP2. Nature 468(7322): 443. Liu J et al. (2012) Signaling defects in iPSC-derived fragile X premutation neurons. Hum Mol Genet 21(17): 3795–805. Paşca SP et al. (2011) Using iPSC-derived neurons to uncover cellular phenotypes associated with Timothy syndrome. Nat Med 17(12): 1657–62. Tian Y et al. (2014) Alteration in basal and depolarization induced transcriptional network in iPSC derived neurons from Timothy syndrome. Genome Med 6(10): 75. Heymann DL et al. (2016) Zika virus and microcephaly: Why is this situation a PHEIC? Lancet 387(10020): 719–21. Quadrato G et al. (2016) The promises and challenges of human brain organoids as models of neuropsychiatric disease. Nat Med 22(11): 1220–8. Kelava I & Lancaster MA. (2016) Dishing out mini-brains: Current progress and future prospects in brain organoid research. Dev Biol: 420(2): 199-209. Mason JO & Price DJ. (2016) Building brains in a dish: Prospects for growing cerebral organoids from stem cells. Neuroscience 334: 105–18. Muffat J. (2016). Efficient derivation of microglia-like cells from human pluripotent stem cells. Nat Med. 22(11): 1358-67.